This post is late, I know. But let me explain....the creativity has been gone now for at least three weeks...in its place is constant nauseau and a tiredness felt deep down in my bones. I know that Erin, my sweet partner for this challenge will forgive my total lack of ability to do anything and I'm learning to forgive it in myself. I'm not used to be next-to-helpless, but there are some things that just have to give at least for a little while. In the meantime my body is making a baby and I'm along for the ride! My country was Turkey. I was excited because Istanbul sounds to me like such a neat place and so diverse. It's often referred to as the gateway between Europe and Asia where the two cultures and religions collide finding a balance between the old and the new. My dad wanted to take us last year but we ended up choosing London instead (I have absolutely ZERO regrets about that decision). Here was the photo that I chose. I was drawn in by all the colors and patterns and shapes. I think it's quite lovely. My plan was to create a bracelet bar using a strip of peyote that would have a similar pattern in it and then creating the bracelet around it. I still have the drawings and everything on my desk and I'm determined that one day I'll get it done! But, just so I don't leave you completely empty-handed, I thought I'd show you something I created two years ago that was also inspired by the Middle East. This is the Ishtar Gate, currently in a museum in Berlin. It is actually not from Turkey, but from the Persian Empire (which today is Iran). If I remember correctly, it is from around the time of Darius (don't quote me on that). In her book, she had a photo of the Lion from the gate, but I was drawn to the gate itself and the shape of the turrets and the patterns in the tile. The result of the Ishtar inspiration was my Persian Tile Ring. I took the colors and shapes and used a variation of circular peyote to create a very bold, very structural ring. I went on to take the same idea and flatten it to create a series of brightly colored architectural pendants with a lot of persian flavor. I'm sorry I don't have anything bright and fresh for you, but I do hope you'll stop by Erin's blog to see what all the participants created. I've been so impressed by what I've seen, I just haven't been able to sit at the computer long enough to comment and visit everyone's blog, but I will!! I hope the next time you're stuck in an inspiration rut, you'll spin a globe and use your finger and a mouse to transport you to a world of new shapes, colors and features and each time you find an idea run with it, experimenting as you go. Your beadworks are always great ... I love them!!! Oh goodness I remember those days of exhaustion. I'm glad chose to take care of yourself. Your beadwork is fabulous! 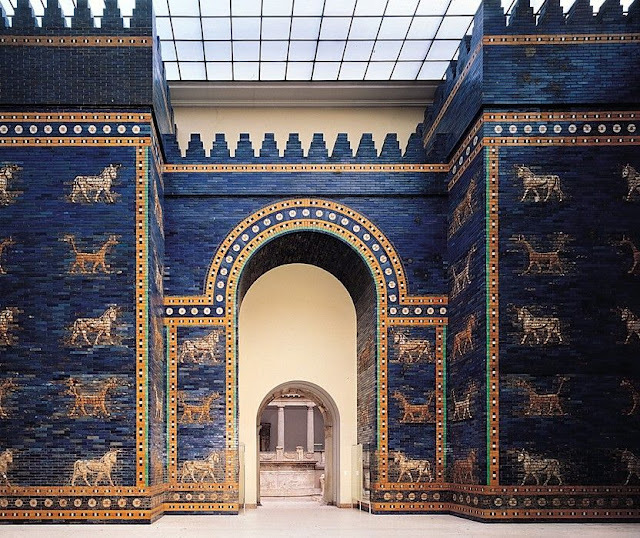 The Ishtar Gate is magnificant, and I can see why you were inspired by it. Love the mosaic bead work. Take care of yourself! You had enough things bright and fresh for me. I loved reading your blog. Very fresh and inspiring. Beautiful art you created. Nice knowing you from your work. Bookmarked. Will visit again. Dita. Hope your feeling better soon ;) -You will be. Missed you on my the first tour stop...I participated too. Your ring is gorgeous! I remember the Margie & Me challenges! They were so much fun and the pieces that were created by all the participants were great. Lovely to read about your inspiration for you past pieces, looking forward to seeing what you create for your inspirational image. 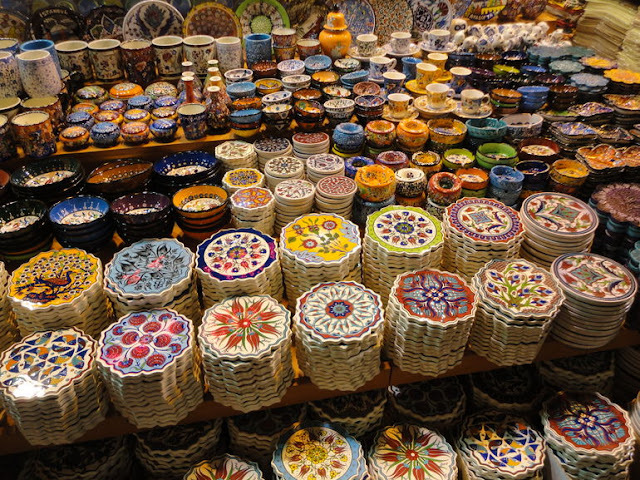 I love the colours of Turkey, so rich in culture. Beautiful photos, and all you need to do right now is take care of yourself and that baby! Good luck! Beautiful color combinations. Like that ring. You always capture the perfect palette for your designs. Check my blog in a bit my sweet friend! I love your ring and pendants as well. The description can be published?